"It was my destiny to be inside this box." ... love it. Nice. And odd box. 5D! 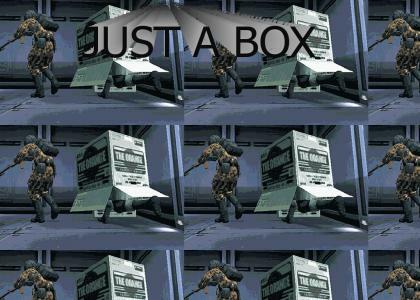 BTW, if anyone has more good quality pictures of snake in a box, post them here! This is a modern breakthrough! I wonder why the Bond flicks never use this state-of-the-art gadget. people are to easily amused. That was the best mgs imo. I used Psound (google it) and ripped them right from the discs. Yes the good ol cardboard box trick.A classic!! BIG BOSS HERE. CARDBOARD? WHAT'S GOING ON? ARE YOU PLANNING TO MOVE OR SOMETHING? OVER. "What's with dat box?" was the best one. The box thing never worked for me, the soldiers always kicked it over. Lmao, this is just as good as the footsteps one. 5 because it has nothing to do with eBaum. and everything to do with... A BOX? Sounds like a n00b going WHAT"RE THOSE BOTS DOING HERE? 5 for the loudspeaker "It's a box." haha, classic box trick! james bond is a noob compaired to snake! I love MGS. So there you go. Did you heard those footsteps in the cardboard box ??! wats in the box? i bet its a stapler. LOL, are all these things people said in the games? Those characters are really stupid. Crap, this is even better than "footsteps". GOT A STRANGE BOX HERE! I really want something good in the top 5 for once. 1d. he said it himself, he feels comfortable in a box, he WAS MADE to be in a box! Are those voices (at the end) I'm hearing from Subsistence?. Funny! The orange MGS box owns the world. "THERE'S AN ODD BOX HERE!?" GOT A STRANGE BOX HERE! LOL, this one is infintesimally better than the lame footsteps one. It's a fuking box leave it the fuk alone! Footsteps!? From the BOX!? Kickass, dude. What other words got killed in that game? Can you use Psound to rip sounds off PS2 discs? Voted 5. Yeah. Remember that trick? "We've got a strange box." A MGS fan couldn't ask for more. This puts the already great "Footsteps" to shame. I think I hear footsteps! Hilarious dude. For the love of god, you have to get the speech between Snake and Sigint in MGS3 about the box. There's an odd box here. 5'd. Thought nothing would top footsteps. THAT'S the Snake I remember! YOU HAVE TO THINK OUTSIDE THE "BOX"! hey I see you in that box there. +5 for great work with getting all those clips from the games. BoxBoxBoxBoxBox. Goes nicely with Footsteps. Now we just need to mix footsteps with boxes. I am logged in on the prison computer right now. This YTMND has given me the inspiration for a plan that just might work! A STRANGE CARD BOARD BOX. Did you say a box? could use a pic of the wolf peeing on the box, but awesome regardless. Holy crap, the word lost meaning. Five. And to think, ALL those sound clips are just a small part of the game. Both you and Hideo Kojima sure outdid yourselves. This makes me lol everytime. Are the sound clips all from MGS? Did you hear those footsteps ? I logged in just to give you a five! "CroutonMagillicutty: could use a pic of the wolf peeing on the box, but awesome regardless." Holy crap, I forgot about that. Adding that would be hilarious! ^^^if someone can help me find that image, I would stick it in. I've all but exhausted my normal sources of images. HA HA! Awesome! I always loved how some of the voices sound so pissed off about the box. "What's this box doing here! What's it doing here!" Cardboard Box for the win. Is it me, or does the box trick never work? I could be inside, against the wall, out of the guards' path, and they still won't fall for it. Nice sound. Amazing they made so many sound files for a damn cardboard box. You rule, Metal Gear is awesome. Can somebody please make a YTMNSFW with this box montage sound clip and just flash a bunch of pictures of vaginas? I am sooo trying this in real life. Btw Im never going to able a cardboard box again. Im afriad some guy will jump out at me. Take care of your box and it will take care of you. I was going to vote it five til my ears were bludgeoned by that CLICK after half the people talking. This and footsteps both get fives. HAHA! "I'm in a box!" Wonderful. The box = love. Hilarity. Absolute hilarity. THAT'S the Snake I remember! This box contains our own universe! "we gotta strange box here" you win. I don't say this often, but this is one of the finest YTMND's ever. A++. Who's the guy that says "A cardboard box, huh?" near the end of the loop and why does he sound so familiar? I'm kicking myself because its probably obvious and I can't remember it! AHAHAHAHA! I walked around the streets in a box labeled "To: Heliport" once. Yay, it's metal gear solid!! I like that game so ima five this!!!1!! a great followup to "footsteps". 5. What's with the box YTMND? It's too good for a 5. Oh well. These crappy YTMND's about MGS people talking about stuff are stupid. Oh.. my favorite.. the good old: "JUST A BOX!" Needs the wonderful dialogue in MGS3. "I can't explain it. I just saw this box... and I needed to get inside it. Like it was my destiny. I think you should get inside this box." "I don't want to get in the box!" MGS < splinter cell. a box is the extent of his stealth. I DEMAND YOU TURN THIS INTO A RAP A'LA PO-TA-TOES! whats up with that box? GOT A STRANGE BOX HERE! a box? whats that doing here? Could somebody PLEASE tell me how to get sound effects from the game? I'm trying to make a Flash movie but I have no clue where to find MGS wavs. Nice including the SSBB one. This was always like a fad that never had an original...nice work. hahaha the guards are such idiots. its funny how after about 15 times its not a word anymore,sound like Baakz. its a Baakz! The word "box" seems to have lost its meaning now. That's fantastic. Great audio editing and video compiling. Lots-o-fun. "The word "box" seems to have lost its meaning now. "- Yeah it seems like just another sound now. Ahhh, the box. Good times, good times. You know what happens under the box, correct? Could you tell me, I'd like to know. Thanks. better then the steps one even. the ultimate cardboard box site. Nice addition :D don't worry, I won't copy it. I'm still using the old version for my site. My best MGS box moment was in Sons of Liberty, Tanker Chapter. Find the box, shoot someone, go back to the storeroom, get shot at. Ah, memories. How is a box supposed to look like? how is a box odd?